I decided to try a wild section of howards creek I heard would be decent. 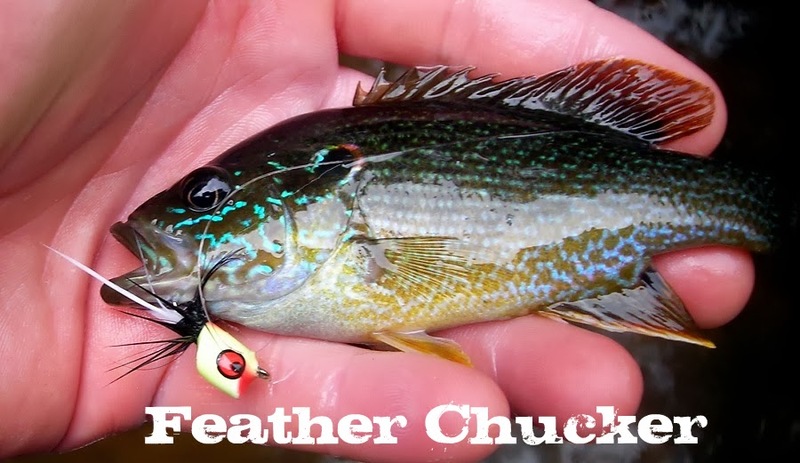 I parked the car by a bridge and found this great spot.. On my first cast I saw some shadows dart around the pool Then I recieved a hit and saw a splash and a nice fish head come out of the water only to spit my fly. I recieved a few more hits on the next casts but I was unable to hold on to anything. I moved up stream. The water was really nice and clear. 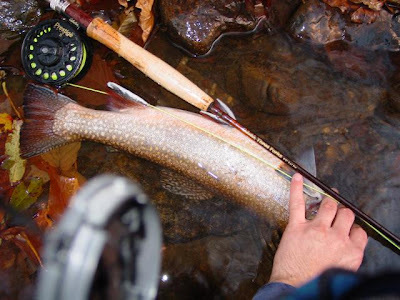 Plenty of spots for wild trout to lie. I caught one in a run a few 100yds from the first spot, just a little wild bow. I've developed some really bad habbits in the off season. One is really unforgivable. I was tying really poor knots on my flies. I lost at least 3 fish to flies just coming off my line and the fish swimming away with them. I kept moving up stream until I came to this spot. I had to just stop and enjoy the view. It was such a beautiful spot. The weather, water and atmospere were so nice. It made me remember why I love to fish in the first place. It's not all about catching fish. It's about being outside and experience scenery like this. I decided to head back and check out some of the spots I tried earlier. Still no luck. I was glad to get outside, it was a fun day regaurdless. New River This is the first time I've fished this portion of the New River. I talked to a game warden who said there were 6lb trout in here. I was skeptical, I've never heard of anyone catching anything out of here that was of decent size or worth talking about. I stepped in the creek without my hopes up. The water was pretty slow moving. I didn't see any signs of fish. I worked my way downstream. The water started moving faster and I could see splashes. I couldn't tell if it was my eyes playing tricks on my or if it was actually fish. As I got closer I realized it was fish hitting the surface and I could see there was a nice caddis hatch going on. The caddis were everywhere laying eggs on the water driving the fish crazy. I couldn't get anything on my first section I fished. I worked downstream until I came to this section. From me to that tree down in the distance was full of trout hittnig the surface. I tied on a San Juan and on my second cast I landed this guy. This was great in two ways. It verified trout do indeed live in this river. Also they are decent size. This guy is close to 14inches. He's obviously super healthy. Nothing else seemed to be interested in the San Juan worm, so I switched to what I saw fluttering on the surface. A caddis. Still no luck. I don't know if it was my casts or the fly but fish were hitting the surface everywhere except for where my fly landed. I called it a day after getting frustrated. I was happy to observe a nice hatch. I'll have to explore this place more. I believe big fish can lurk in this river. But finding them would be really hard. I'm sure I'll have more reports from this section. Helton Creek This place is one of my all time favorite creeks. It's delayed harvest and is in a location that's not close to any major cities. What this causes is a low pressured fishing environment. It gets it's fair share for fisherman. 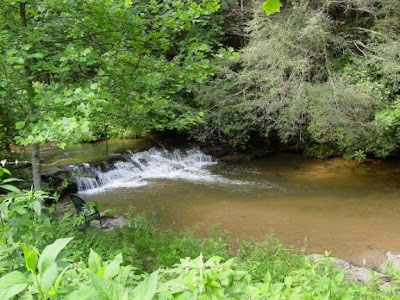 But there is about 7miles of creek to fish and you can easily get away from people. In the late summer the fishing is rough, but it's rough anywhere. If you can get there within a month after they stock, you'll be catching possibly the most fish of your life. For the first time I didn't have this place all to myself. There were quite a few fisherman scattered down the creek. I found a place away from them and had a secluded section I could work. First off, the helton has scenic views everywhere. When I think of a perfect trout creek this place comes to mind. There's tons of holds everywhere for fish to hide. There was a fish in every hole I tried. The fish were interested in a certain type of presentation but I'm sure you can figure it out. 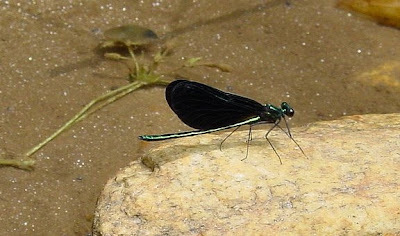 The usuals were working, pheasant tail nymphs size around 16-18. I had my first hit on a san juan worm by a brown lying under a log. A word of caution to you, when you fish here, make sure your footing is good. I almost had some near bad spills. The rocks are pretty slick and the water today was murky making it hard to see where you're stepping. I almost broke my neck releasing this guy. He was a ferocious brown. Hammered my nymph right off the surface. Some fish were really aggressive while others had to be enticed. It was a really fun day. You had to work for the fish but not too bad. It wasn't frustrating. The wind picked up which made the fishing a little more difficult. I tried to find places that would allow me to duck under the wind. It was hard to do but manageable. Right before left I went to a calm spot where the current was going around a rock. I could see activity just behind the rock. I worked my nymph around the rock and caught a decent bow and this guy. I liked the colors of him. The picture does it no justice. I was fighting trying to take the picture as fast as I could and the fish flopping around. I need to find some new method of taking the pictures. It's no fun taking pictures of the fish this way. I feel it's too stressful for the fish. I don't touch them that much but they stay out of the water 3times as long as they would if I just pulled the fly and released them. 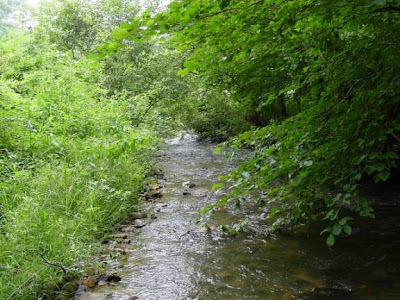 This is the spot where I caught a huge brook last fall. Probably 3lbs or so. I didn't have the same luck today but I did get some good size fish. The day was perfect. Great weather and fishing. You can't ask for more. Linville Creek After visiting Grandfather Mtn's dollar days, my fiancé and I decided to check out Linville Creek. 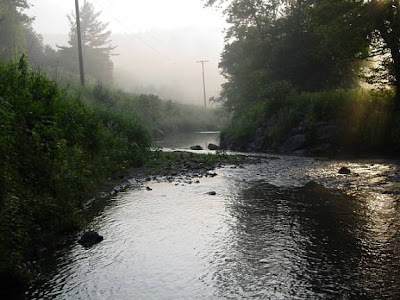 This creek is one of the only creeks I've fished that is catch and release only. Pretty neat. The water is really nice here. Lots of pools and places for fish to hang out. This is the first place you'll see. There's fish in here. I saw a nice fish try to jump up this waterfall while I was fishing it. It was pretty comical. The fish was huge but didn't even make it 3ft up the fall. There's no way a fish could make it up this. 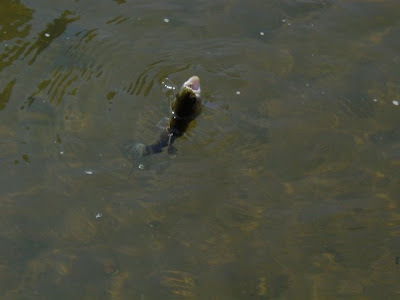 I figured it was a instinct thing that made the fish want to go upstream no matter what. After about 15minutes of fishing I caught this little guy. The colors of the fish here are really vibrant. I don't know if it has to do with the altitude or water color. The water seems to be the same color as other places but the fish are more colorful for some reason. This is how most of the stream is all the way down. I tried some holes here and there. Caught one more fish then decided to leave. BE CAREFUL FISHING HERE! You will have to rock hop and the footing is not great in a lot of places. The holes in between rocks are deep. You don't want to fall in and get sucked under one of them. The weather is warming up, so be aware of snakes as well. I didn't see any but I'm sure they were out. I'm definitely going to come back here soon. This is a great place. The fishing was a lot better then I expected, I think more people come here to sunbathe and swim then fish. These are the moments that keep me coming back. I love driving up to the river and seeing scenery like this.. The picture does not do it justice. You can't help but feel happy and catching fish is the farthest thing from you mind. First you just soak up the beauty and the nature. Views like this are around every bend of the river. I fished this section for a couple hours. I had a few on but only landed one. It was a great day to be on the water, not too hot. Cool breeze and cool water. The fish were biting, I just couldn't seem to keep them on. I had one of the finest days ever on the Watauga DH. This place never lets me down for good fishing. I caught a fish in about 15min on a yellow sally. Unfortunately that would be the only fish I'd land all day. I scouted different areas to fish and saw one of these guys. This is a giant stonefly, they look like a bird while flying. They are kind of clumsy and a little spooky when they fly towards you or land on you. They are huge, this one was over 3inches long. I switched flies and went with something I had that looked close to a giant stonefly. I had some ferocious strikes but nothing seemed to stay on. It was exciting none the less. It's so fun dry fishing. I pretty much forgot about it. I've been nymph fishing all winter and spring. 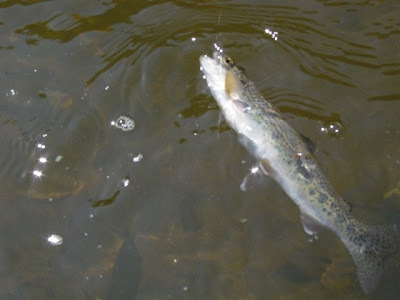 I was like a little kid again when ever I'd see a fish come up from the depths to attack my fly. Many times I jerked the fly from the fish before he could take it. Other times, I couldn't tell you what I did wrong. I had a blast. These guys scattered the area from here and there. It got pretty warm fast. So they moved to the shady side of the rocks. They are pretty impressive bugs. I finished my fishing at this spot. Just enjoyed the view and practiced my casts. It was a great day. Probably one of my best times here. 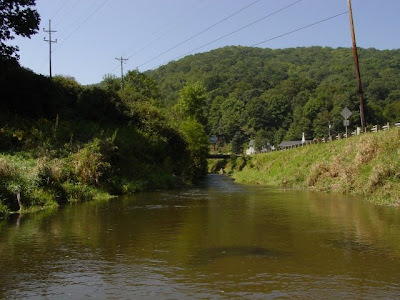 I decided to check these creeks out because I figured they would not be fished much. I arrived at Stoney Fork about 1:30pm. I was pretty excited because the stream is pretty secluded and overgrown with bushes and trees. I got into the creek by a construction site. I noticed bugs all around. This gave me an even better feeling of how the fishing conditions would be. On my first cast I was instantly introduced to the bushes on the side of Stoney. You can see how they make casting more of a theory instead of a reality. I managed to get some decent casts into some nice pools. No luck though. Not even a hit. I walked the stream looking for fish and noticing really pretty damsel flies. I’ve never seen such neon damsel flies. The stream never widened. This was about as wide as it ever got. There didn’t seem to be any fish at all. I’m sure there were some fish in some of the holes but they were not interested in anything. I did have some minnows try to viciously kill my fly several times. I ended up catching one. It was amusing for the time being, but I wanted to catch some trout. The rest of the stream yielded no trout. I tried a different section, still nothing. The water was really shallow and murky. I still feel I should have caught something. I decided to give up and try a different stream. 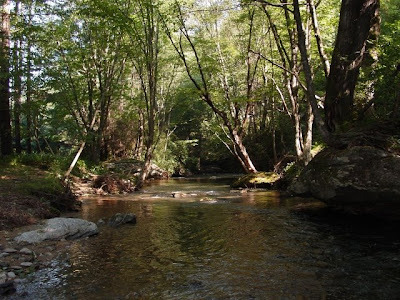 Fall creek is not on the trout maps but it’s on the NC Delorme. I decided to check it out and had high hopes since it wasn’t a designated trout stream. As I approached the creek I saw there were plenty of places for fish to lie. Also, there was hatchery supported signs all over. I now thought I was definitely going to catch a fish. I drove to the headwaters of Fall Creek hoping maybe people wouldn’t drive that far. I came to a pool that seemed impossible not to have fish in it. Again I realized how fast a stream can be fished out. When I walked up to this hole, I noticed a chair next to it. Sitting on this chair was a empty carton of Night Crawlers. That didn’t give me a warm fuzzy feeling. I proceeded to fish the hole. I had a nice hit and had a trout on a for a few seconds but he got off. I don’t think he was very big. 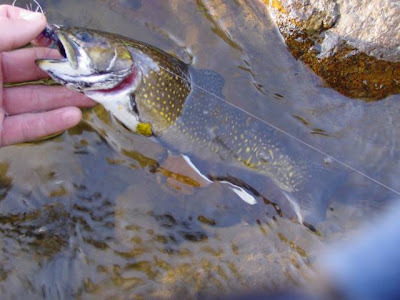 I fished downstream trying various holes. The creek seemed as barren as Stoney. Not fun. I ended up giving up on the day. I went home and checked the stock reports for the streams. I couldn’t find any on Fall Creek. I found that Stoney is stocked with 125 fish a month. That really isn’t much if you figure 20 people in a month take their limit all over those fish are gone. That would explain the lack of fish population in the creek. I’m glad I checked these streams out. It gives me a idea of what to look for before I go to a creek. It was still a fun day being in such pretty scenery. I don’t know if I’ll visit these streams again. hurricane Katrina which has caused the water to rise a considerable amount. this recently. I figure the trout are really hungry or it's just a coincidence. I tried to get a better picture of this guy but this is all I came up with. He was about 11-12 inches, not a monster but a fun fish none the less. Plus he was the first fish of the day. I fished the pool some more and it was a lot deeper then I thought. I didn't feel safe moving further up the stream. I decided to try a section I've always wanted to fish but haven't had a chance to yet. This is another beautiful section. It's right up stream from the pool shown in the other pic. 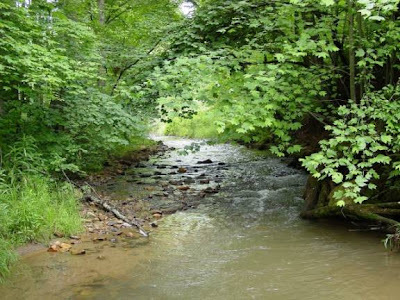 I could see fish jumping up at some branches on the side of the stream and the splashes seemed to be big. I figured this was a good chance to catch a nice size fish. I tried a hopper or what I had that looked like a hopper. No hits or anything. I figured I spooked the fish because I didn't seem them jump up at the branches after I started casting. 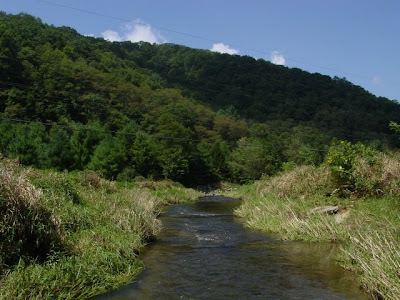 I continued to fish the surrounding area, there's definitely fish here and good opportunities for nice size fish. I think it was just the wrong time of day to get them. It was around 1pm and the the sun was not in my favor. My shadows were right over the water. I decided to call it a day. At least I caught one fish. It was fun just being out in such great weather. I heard about a friend catching a 22inch fish down here so I decided to check it out. I didn’t catch one that big but I did manage to catch this guy. Not a monster but still a nice fish. The day was great. Beautiful, fish, weather and water. I fished the Helton today after a tip that it was stocked recently. I've never seen so many fish. I was almost stepping on them at times. It was ridiculous. I caught a few here and there but I missed about 20. I caught this guy in a little riffle. The water and weather was really nice. I was pretty much fishing by myself. I decided to try a upstream section I haven't fished before. I saw tons of fish and I came to a section where there was a tree that had fallen in the water. The branches were bare. On the far side of the tree where the bank was there was a rock over hanging the water. As I walked up closer I could see something swimming in between 2 of the branches. I could tell it was a big fish. I decided to tease it with a nymph it wasn't interested. I switched up to a wooly bugger, it hit, then turned, from the flash and the movement it made I could tell this fish was a monster. I switched up again with a black wooly bugger. This time the fish wanted it bad. He hammered it. I think he was surprised to be hooked because he didn't fight hard at first. Then when he realized something had him he went crazy causing a 2foot splash to appear. He used all the tricks in the book, trying to get tangled around the branches of the tree and going downstream. I had to remind myself I was wearing waders, I instantly jumped further into the water and spun my rod around the branches to make sure I didn't get tangled. It took a good 5min to finally land the fish. Then there was the exciting part of trying to get the picture. He still had a lot of fight left in him. He didn't want to stay still and wouldn't you know it, my battery was seconds from dying. I felt killing this beautiful fish wouldn't be worth getting a great picture so I took one more, and let him loose. I decided to end it on that note. I couldn't see the day getting any better. What was unbelievable is I saw bigger fish then this one in the creek. I want to think this fish was 20inches or over, but now that I'm really studying the pictures I think he may be just under that. Still a great fish and easily close to 3lbs. I was ecstatic. It's pretty funny that the 2 big fish I've caught this year have been brooks. 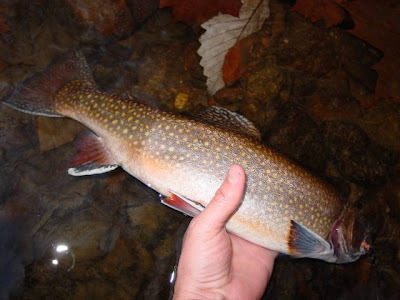 I truly believe the record brook trout is in the area. Maybe not the Helton but probably some stream within 100miles. It has been super cold lately. Yesterday morning it was 24 degrees. 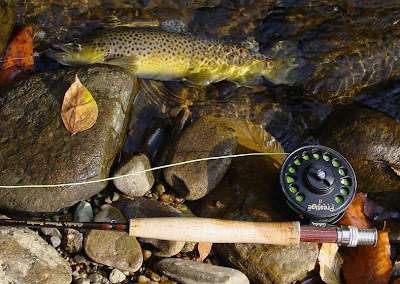 I still haven't gotten my Orvis rod back from being repaired. My free time now is spent thinking about the birth of my new daughter, work and school. I recently went to a few christmas parties. They were both good times. A rare occurence for me, I drank a little too much at the one this last weekend. A buddy brought orange juice and vodka as well as some goldslaugher. I guess we wanted to relive our early 20's. I was fine after a couple screwdrivers but the goldslaugher finished me off. I'm trying to figure out where I can go fishing in this cold weather. I've heard crappy like cold weather. I think I'm going to test this theory tomorrow. I still keep my 5wt in my car and the work ponds have been calling me. It's time for a visit. This year has been really strange, I've had some great fishing opportunities but the catching fish part has been just ok. I hooked my first carp which was exciting, but it broke off. I caught some smallies for the first time, but none were over 12 inches. Drum fishing was a great experience I look forward to doing again. I can see how it is exciting. I'd like to hook up with one of those. I was able to finally get to the mtns but the weather was cold and I didn't have much time to fish. This last weekend I was on the water for maybe an hour. It was a hatchery supported stream. The water was low and the stream had obviously been pillaged. I can't believe how much stuff I've gone through this year in terms of gear. I really need to figure out a system. I lost one rod and reel to the New River. Broke my Orvis last week. My friend fell on my redington and broke the reel. Somehow I managed to lose my felt bottoms for my Korker boots? I swore I was wearing them on the smallie trip. How could they have just come off? I'm determined to find them. I've already searched my house and storage area but here is no sign of there existence. I've found the mud bottom souls but can't for the life of me understand what happened to the felt souls. The weather is starting to cool down and my focus is turning more to the birth of our first baby. I want to get the rod fixed and plan some trips for this winter, but I think that's going to take a back seat and this spring will be about raising a baby. This last weekend it was confirmed the Family Reunion will be in Idaho next year. 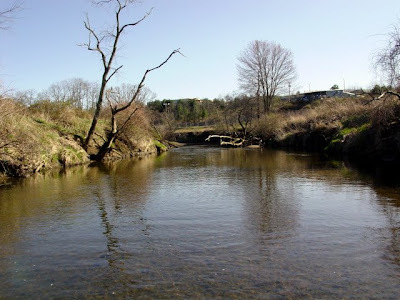 It is in June and the snow melt might effect all the rivers and creeks in the area. We'll see. I'm going to try and get back in touch with my Neuse River fishing buddy to attack the Neuse this winter. I've always been one of those people that learns things the hard way. Even if I get good advice and know there's a better way, I seem to do things the hard way over and over until finally I give in. Today was my latest lesson. I went fishing at lunch at the pond by my work. The weather was rediculous, in the low 70's, not a cloud in the sky. I saw the carp that I beleive I hooked a couple weeks ago. I made a few futile casts towards it. It ignored my fly and continued cruising into the depths until it's enormous shadow dissapeared. I waited for the shadow to reappear, but I was dissapointed. I worked the banks of the pond, not really expecting much. I never did catch anything. I went back to my car and kind and started thinking about this weekend and how I'll get to trout fish. When I pulled into the parking lot, I started to gather my things and rolled up the window.... Crackle, crackle, SNAP.... POP!!! What's sad, is I knew what this sound was. There was no doubt that was the sound of a rod tip being destroyed by a window closing. I didn't want to look at first and hoped my hearing was just bad, or the window bent the rod enough to make a slight crackling noise like a stick on the threshold of snapping. The end of my rod made an L shape with a few strands of fiberclass holding the tip on and the fly line reinforcing it. I said a few colorful expletives and was reminded by images of people telling me that you should pack up your rod after each use. This just made me madder. This is the second time I have broken a rod this way. The first time, my wife rolled up the window and snapped one. To make matters worse, this was the 8wt orvis my friend gave me. I haven't even had this rod a year. So anyways, I'm going to see if I can get orvis to fix this, I have a TU member who is a friend that might be able to replace the tip as well. The whole situation is just annoying. I'm ending my rant. At least I'll have my 5wt for this weekend. Hopefully it will get a few tugs from eager trout. I will break it down and put it away everytime. That is the only way to ensure 100% that it will never get snapped by a car door window. I only had my video camera so I didn't get many pictures. I caught a few gill and one little bass. I was able to catch this crappie as well. It's the biggest one I've caught yet on a fly rod. The fly I used all day was a small black beetle pattern. The weather was warm compared to what its been. We've had some cold days recently. Today was a nice blue sky cloudless day in the 70's. 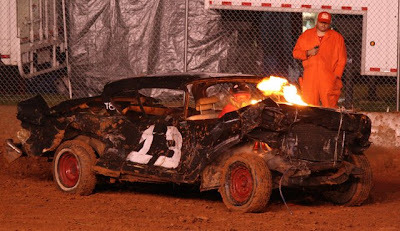 I went to the NC State Fair this weekend to see the Demolition Derby. This was my first time experiencing the fair as well as the derby. 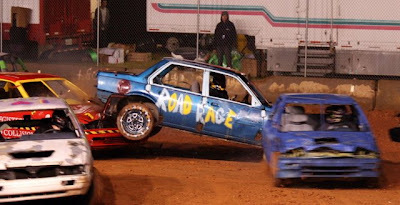 I had a assumption of how a derby goes but this by far better than what I imagined. Especially when the V8 cars came out. It was total mayhem. Twisted metal, roaring engines, and steam from busted radiators. It was a great time. 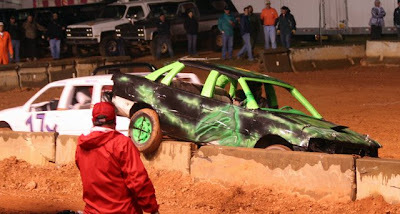 Some of the cars really got after each other. The wagons seems to be the sturdiest cars. Many of the cars crumpled like tin cans. If you've never been to a derby it's a must see. I went to visit a relative in Galax last weekend. We went for a drive on the parkway and some of the trees had really started to change. It was nice to just cruise the parkway and enjoy the views. I look forward to going back for a visit and some fishing. Sorry, that just sounded like it fit, even though it's corny. The anticipation for the red drum trip was mind blowing. Preston and I were as giddy as 12yr olds as we bolted from work and headed out for Beaufort. We took off early to beat traffic and hopefully get some dinner at the Sanitary. It's a great restaraunt and I highly recommend it if you're ever visiting Morehead City. After dinner I tried to talk Preston into surf fishing. The weather was really warm and there was a full moon. It would have been pretty easy to see and wade in the surf. In the end we decided to call it a night, we had to wake up the next day pretty early. The next morning it was 69 degrees at 7am. It was definately going to be a hot one. We got to the boat dock with our guide and the views were spectacular. It was one of those days, you felt lucky to be alive. We started heading towards the flats, the wind was cool and brisk but not too cold. I was still awing over the views. The sun shining threw the mist in the trees was almost spiritual. Our guide was Dean Lamont, he was a great guy and had a awesome flats boat. I don't know much about boats but Preston seemed like an expert and gave me a lecture about how good this boat was on the way down to Beaufort. The engine is on hydrolics and can be raised an lowered depending on water depth, the boat can float in 6inches of water, and we saw this first hand. It has a platform the guide stands on to alert us of where fish are and when to cast to them. It was a couple hours before high tide. This trip was a real learning experience for me, I never understood how different fishing in the flats is to anything I've done before. When you walk on the beaches in NC, you'll often see little islands hear and there with tall grass. When the tide rises this grass gets flooded. Soemtimes the tide is a few ft over the grass, the fish come in with the tide and feed on the animals they can't get too when the tide is low. The weather was steller. It was a perfect day for fishing. Calm winds, crystal clear water, bait fish running everywhere. We were very optimistic. The first few hours we cruised locations trying to find fish tailing. While we were coasting we'd cast to various areas. In some of the coves we found tailing fish. I had a couple chances at them, but I couldn't get them to strike. Drum fishing is actually pretty tough. On youtube, the drum fishing movies make it look like you just keep stripping and the fish hang themselves. Or that they are as plentiful as bluegill in your average farm pond. This was not like the experience we had. During the whole 6-7hrs of fishing we had, Preston was the only one who caught a drum. I can't say it was for the lack of trying. I cast more on this trip than I've ever cast in my life. My wrist was getting sore from it. I wanted to catch a fish bad. It wasn't my day though. The fishing was tough, we didn't see that many and the ones we did see were spooky. We searched everywhere, flats, creeks, snakey canals. I got to drive the boat on this one. On the way back to the boat dock, there was one more suprise for us. Dolphins were feeding on baitfish, and some came within 20ft of the boat. Dean was nice enough to stop the engine and just let us enjoy the view for awhile. This kind of made the day for me. It was a great day, even though I didn't catch a drum. I am eager to go again. I'm not sure when it will be, but I'm definately going to put it on my things to do list. When we were loading the boat, I slipped a little on the ramp, Preston was coming down the other side of the boat when I heard him start to slip. He slid about half way down the ramp and fell right near some oysters. Oysters are bad news, if you fall on them it's like falling on glass. I cringed as he went down and asked if he was ok, praying that he was. His response slowly getting up was "NO!" I came around the boat as fast as I could and he showed me his hand, where there was a huge gash in his palm. I knew right away he was going to need stiches. We stopped the bleeding and Dean had a first aid kit and patched him up. We made a detour from Raleigh and headed to a urgent care faclity in New Bern. I'll tell you what, you never want to fall on oysters, he had to get and X-ray to make sure no fragments were in his hand, they had to clean it to make sure it wasn't contaminated. To top it off after the pain of stitching everything he had to get a tetnis shot. He was sorry we were going to be going home so late because of him. I just told him his health is more important than being on time or fishing. I also added at least he didn't get hurt before we went fishing, then the trip would have been ruined. Preston is always fun to fish with and I look forward to going on more trips with him.